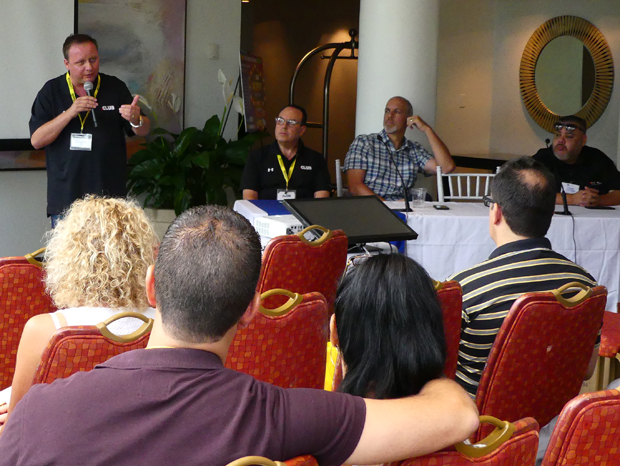 The 2016 edition of THE Domain Conference (TDC) doesn't officially begin until the traditional Welcome Party tonight (Sunday, September 11) but there was still plenty of activity at the show venue - the Hyatt Regency Pier 66 Hotel in Fort Lauderdale, Florida - on Saturday. 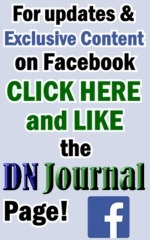 Most of that was due to the addition of a new standalone event called Startup Saturday (SS), the brainchild of TDC Co-Founder Ray Dillman Neu. SS was designed for local entrepreneurs seeking advice on how to launch or grow a new business. Though domains were not the primary focus of SS, many of the speakers were successful, well-known people from our world. 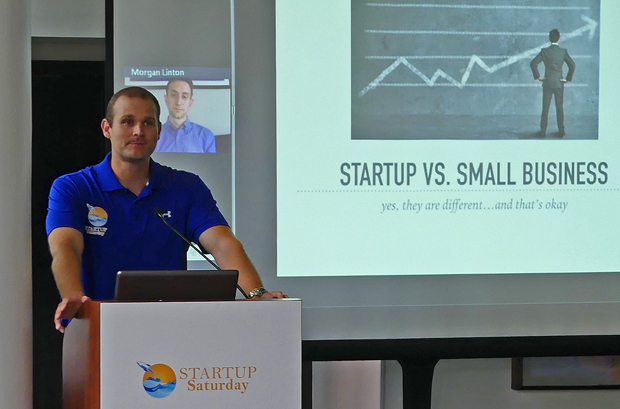 Above: Ray Dillman Neu, Co-Founder of THE Domain Conference and originator of TDC's Startup Saturday, welcomed attendees to the first SS event at the Hyatt Regency Pier 66 Hotel in Fort Lauderdale September 10, 2016. Here he is introducing FashionMetric.com Co-Founder Morgan Linton who delivered the first presentation of the day via Skype. Morgan covered the differences between a startup and a small business. 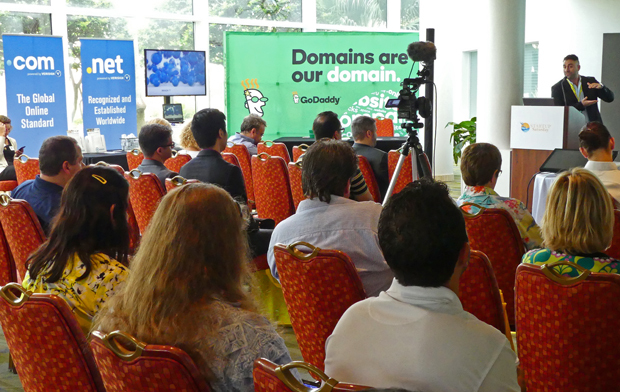 Above: Next up AmbitionInsight.com Founder Brett Napoli told the audience How to Turn a Domain Name Into a Business. 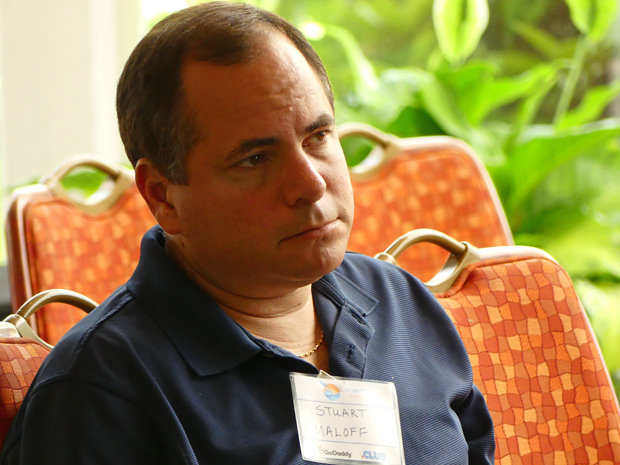 Below: South Florida entrepreneur Stuart Maloff absorbing information at Startup Saturday. Above & below: In the final session before a lunch break, .CLUB CEO Colin Campbell (standing) joined (seated left to right in the photo above) moderator Jeff Sass (.CLUB), Barry Kates and George Verdugo (VisitSpace.com) to deliver one of the best panel discussions I've sent at any conference anywhere. In a session titled Lessons From the Edge the quartet took on a topic most entrepreneurs prefer not to talk about - failure. The speakers detailed overwhelming challenges that resulted in a previous enterprise of theirs coming close to failure or failing, what they learned from that setback and how those lessons helped them rebound and realize their dreams. Their honesty was refreshing and their advice inspirational. Entrepreneurs need to know there is a good chance you are going to get knocked down but you can get back up again armed with valuable, albeit painful, experience that will make you better equipped to succeed than you were before. Startup Saturday concluded with three afternoon sessions featuring individual presentations from Victor Pitts, Evan Oder and Jeff Sass (above). 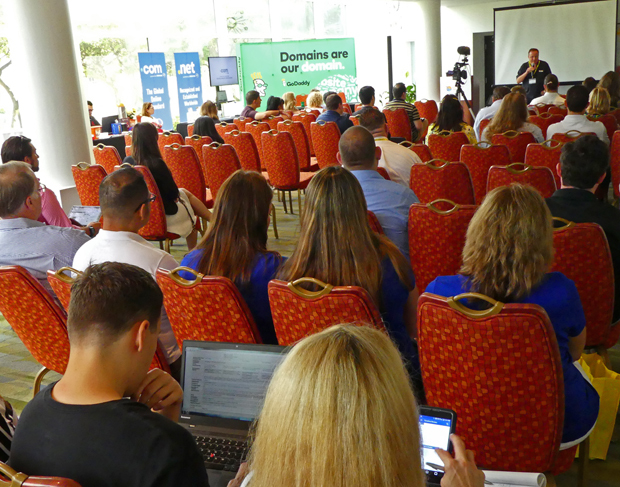 Jeff detailed How .CLUB And Other New Domains Are A Smarter Branding Bet For Startups & Entrepreneurs Worldwide. Before Jeff's closing talk Victor offered Domain Name Branding and Purchasing Tips and Evan provided advice on Picking the Best Business Partner. Above: While Startup Saturday was going on inside, Cabana Networking was open at TDC's private pool area at the Hyatt Regency Pier 66 Hotel. That's where we snapped this shot of (left to right) Mike Morrison (Rook Media), TDC Co-Founder Barbara Neu, and recently retired police officer turned domain investor Jim Garbutt. 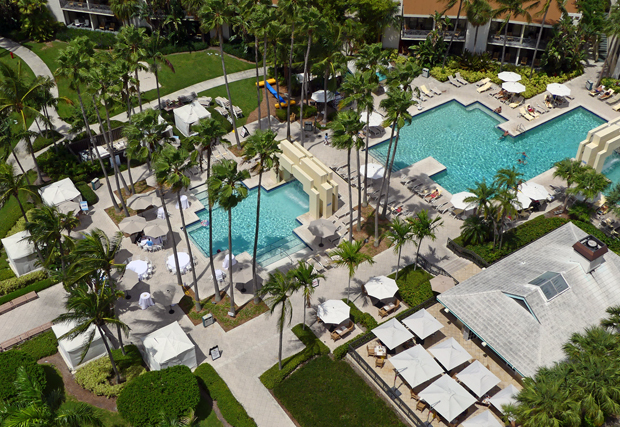 Below: An overhead view of the Cabana Networking area taken from our 13th floor balcony. The sponsor's cabanas ring the private TDC pool at left. 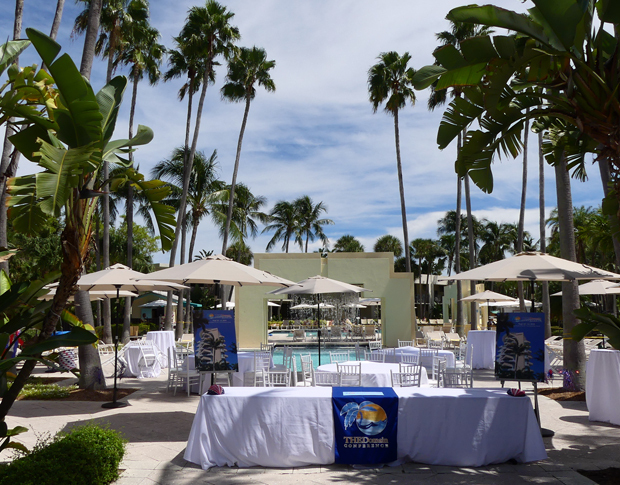 There are also tables set out with full umbrellas to shield guests from Florida's intense summer sun. Attendees can freely move between the cabanas and the indoor Neustar Lounge for free drinks and snacks in air conditioned comfort (the Lounge is located in Windows on the Green a few steps away on the same level). Above: A ground level view of the entrance to TDC's poolside Cabana Networking area. With most conference attendees arriving today this will be the central outdoor gathering point with the adjacent Neustar Lounge offering a convenient indoor retreat. Above: Saturday night gave TDC guests a chance to explore Fort Lauderdale, check out a local restaurant or attend an off-site corporate party. .CLUB CEO Colin Campbell hosted one of the latter at his lovely home on the Intracoastal Waterway, just a few miles upstream from the Pier 66 Hotel. 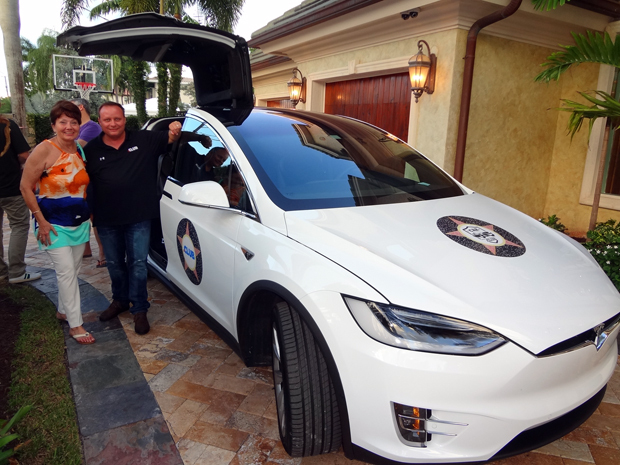 Here Colin gives Diana Jackson a look inside his new Tesla X - a state of the art all-electric self-driving car. The driver can take over when necessary but Colin said the car did 90% of the driving on its own when he had taken it to the hotel earlier in the day. 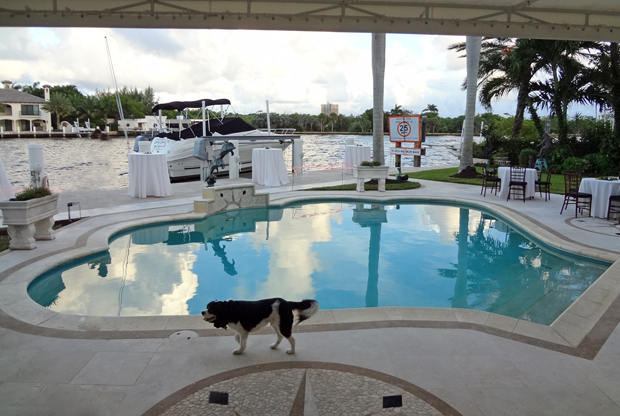 Above: A view of the Intracoastal Waterway from Colin's rear deck a little before sunset and the arrival of several dozen more guests for a party hosted by the .CLUB CEO, his lovely wife and their three King Charles Spaniels! 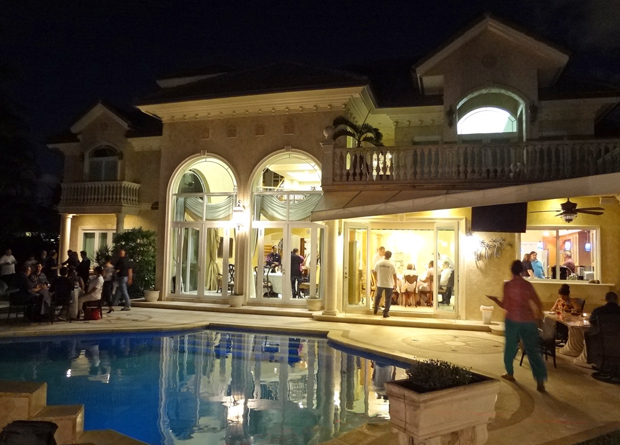 Below: .CLUB guests enjoying a beautiful Florida night (and a lot of talk about domains!) at last night's party at the Campbell home in Fort Lauderdale. After two days of pre-conference activities THE Domain Conference gets into full swing with tonight's 7pm Welcome Party in the revolving Pier Top above the Hyatt Regency Pier 66 Hotel. 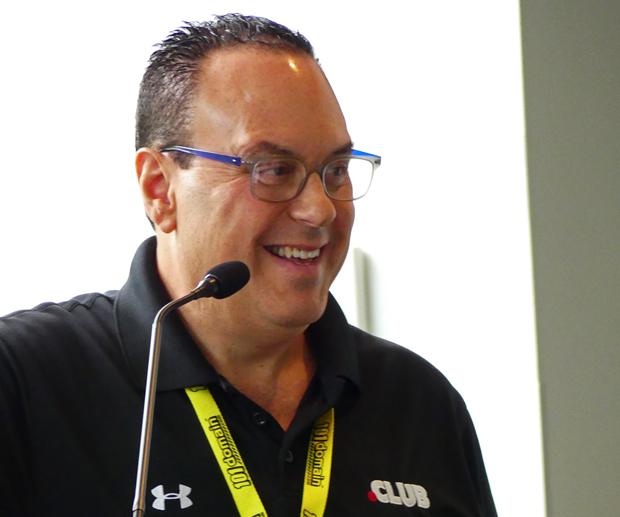 Two big business days will follow Monday and Tuesday (you can check out the full agenda here) before the 2016 show closes Wednesday morning, September 14, with the traditional Farewell Breakfast (sponsored this year by MediaBreakaway.com CEO Scott Richter). I'll have all of the Sunday photos & highlights for your in my next post from Fort Lauderdale Monday morning.